However, this does not make clear as to whether ‘literacy’ under Kress’ conception and definition can be deemed a skill, item of knowledge, combination of the two, or neither. Whilst he quite rightly points out that the term ‘literacy’ has, and is being, used to lend credibility and legitimacy to questionable ideas (p.24-25), this does not mean he needs to ‘throw the baby out with the bathwater’, so to speak. One of his main arguments not to extend ‘literacy’ to mean more than creating messages using written forms is that other languages do not contain the word. I believe this to be a weak argument. He asks rhetorically whether English, as the dominant world language, should impose the word ‘literacy’ and demand that other languages have a translation of it. He conflates this with the quite valid point that the more things to which a concept can be applied, the less it means. 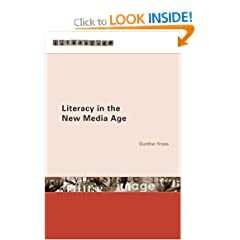 To my mind, there’s absolutely no valid reason Kress gives why a modifying prefix such as ‘digital’, ‘media’ or ’21st-century’ cannot be placed in front of the word ‘literacy’ to make it apply to a specific context.